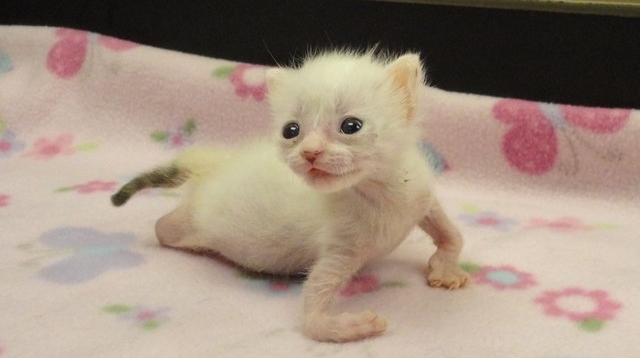 Pretzel the twisty legged kitty proves that you don't have to be 'perfect' to live a Purrfectly happy life! Kitten Rescue Los Angeles volunteer Laura Hawthorne wrote: "These babies (Pretzel and her siblings) were born on June 19th and within hours of their birth they were dumped at a local animal control facility, presumably to be euthanized. As a notorious 'sucker' for both abandoned newborns and special needs kittens, I was contacted about bottle feeding and caring for these fragile little angels." "I cleaned the babies up as best I could, and began tube feeding them a special homemade formula until they stabilized and adjusted to nursing on a bottle. The babies traveled to work with me each day so they could be fed every two hours around the clock. Pretzel began to gain weight and show developmental milestones appropriate for her age. " Pretzel was the only one survived in her litter. She never gave up and grew bigger and stronger everyday in her foster home. Responses to "Twisty Legged Kitty Lives a Purrfectly Happy Life "
Great story on perseverance and fighting spirit. Unfortunately this happens quite often when 4 or 5 month old kittens get pregnant. While working on a ranch, I saw this happen many times. Yet the mother made beautiful babies, but her babies had babies, not so good. The second litter would be ok, but that first litter just broke my heart.